organic cotton hat 2, a photo by Jan2132 on Flickr. A much happier Miss M. The slouchy topped hat was a big success and I'll do more, but in wool. The glasses came from Mad About Science in Victoria as part of a 3D writing kit. She has been home about ten days and we are all having a bit of a respite. Well, home apart from clinic visits for tests and chemo. However, she has not been an inpatient from side effects of the chemo. The little suitcase came from a Ravelry friend in England. Beautifully packed, it was full of tissue wrapped small parcels of craft materials. She loved it. I've said it before, but we are continually amazed at the generosity of fellow crafters. Amazed by gifts, offers of help, prayers, good wishes and so much more. It has blown us away. On that group in Ravelry I joined a KAL of accessories. That was around Christmas time. I certainly did not expect to be making chemo hats for my own granddaughter. This one has a rolled edge and I think I'll probably make a bow from i-cord as decoration. Or perhaps a butterfly, she likes them. The yarn is lovely, very soft and easy to knit with. I bought it from Suzy hausfrau. It's Malabrigo silky merino, 51% silk and 49% merino. I'm sure she'll love the colour, she likes purple and blues. The colour is "nocturnal," a good name to me. I sat on the balcony this afternoon and did about ten centimetres. It was pleasantly cool and it has been wonderful to have had some rain. 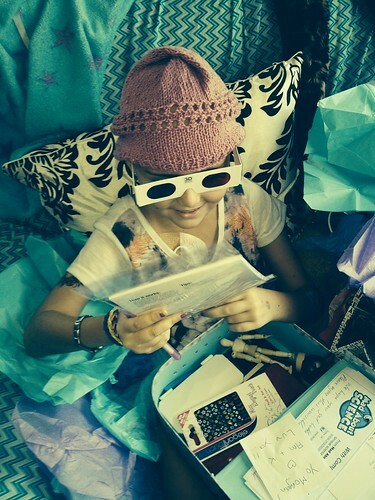 That is such good news, and she looks so funny with her hat and glasses!! It must make you feel a lot happier to see her being a normal little girl. I am envious of you and the rain. I think we have forgotten what rain is here. She does look happy in that photo. Renee, of Suzy Housefrau, was a guest speaker at the Knitters' Guild camp last year -- very it resting although I'm not planning to turn my stitching into a business. I'm praying that God's grace will rain down upon you and that you will feel His peace and love as you draw near to Him in your suffering. Am praying hard for you and your beautiful, valiant granddaughter.